Dedicated to his profession and family, Dr. Robert Johnson lived a faith-centered life that spanned nearly a century. He selflessly gave of his time and his knowledge to his patients, friends, and church. He nurtured lasting relationships with his colleagues and patients alike. Robert will be deeply missed and lovingly remembered. The 1920’s were marked by tremendous prosperity, and previously unknown comforts. The economy boomed, wages rose, and prices fell. Access to electricity provided many homes with the power to run labor-saving inventions such as the washing machine, vacuum cleaner and refrigerator. The post WWI era marked significant advancement and morale flourished throughout the land. This was certainly true on June 27, 1921, when Garrett and Nellie (Schrier) Johnson welcomed their only child, Robert Dale, into their hearts and home in Kalamazoo. When Robert was five, the family moved to Chicago so Garrett could pursue his career in real estate. However, as the commercial real estate crashed due to the Depression, the family returned to the Kalamazoo area. Church was an integral part of Robert’s life early on. Upon returning to Kalamazoo, he and his mother began attending the Netherlands Reformed Church. It was here that his deep-rooted faith began, only to grow and deepen as the years passed. Robert attended local schools, graduating from Kalamazoo Central High School. Unfulfilled in his own path in life, Robert’s father recognized his son's potential. He encouraged him to become a doctor, even dissecting and then assembling animal skeletons to help him learn anatomy! The first person in his family to attend college, Robert admitted to feeling the pressure of this new environment. 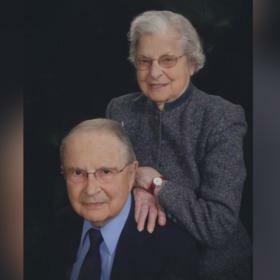 Though at times the challenge was daunting, after enrolling at Western Michigan College at the age of 16, he completed his bachelor’s degree in 1942. While attending WMC, Robert spent summers working in the chemistry department of a local ink factory. It was during this time that he realized what his father had known all along – he was meant to pursue a career in medicine. The ever-new challenges of the field, as well as the opportunity to continually gain knowledge, were the aspects that drew Robert to the profession. He enrolled in the medical school at the University of Michigan, graduating after three years during WWII. The University of Michigan provided Robert with so much more than an education. It was here that he met a dietician named Betty (McCartney) Rogers. Betty was married, but she had a younger sister, Priscilla, who she thought would be the perfect match for Robert. At the time, Priscilla was pursuing graduate work in Psychology at Case Western Reserve University, but Betty was finally able to arrange a time for them to meet. Luckily, Betty was right and the couple hit it off. They maintained a long-distance relationship for a while writing letters while Robert served his internship at the University of Wisconsin, Madison. In their case, absence truly did make the heart grow fonder and the couple happily married on May 3, 1947 in Cleveland, Ohio. After returning from a honeymoon in Florida, the couple settled in Black River Falls, Wisconsin where Robert was offered a position at the Krohn Clinic, one of the first rural group practices in Wisconsin. Before long, the couple returned to Michigan, specifically to Ann Arbor, where Robert was accepted to specialize in Endocrinology, starting his long career with the University of Michigan. 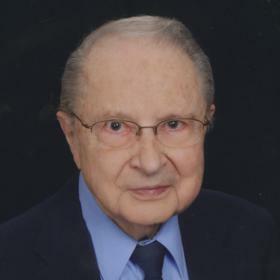 He started out as a Junior Clinical Instructor in the medical school in 1952, advancing to Assistant Professor and ultimately to Professor of Medicine. He was instrumental in establishing Integrated Premedical-Medical Program, or Inteflex, a program that combined undergraduate and medical school education into one specialized curriculum program at the University of Michigan. In this program, he taught a course, “Introduction to Patient Care”, which stressed the importance of compassion in the practice of medicine. He remained on staff at U of M, adding appointments with Michigan State University and Blodgett Memorial Medical Center until his retirement in 1988. He was involved in setting up the Lithotripsy Unit at Blodgett, working until he was almost 80 years old! Robert and Priscilla’s lives were further enriched with the births of their three children, Mark, Claudia and Tim. The children enjoyed growing up in a rural area outside of Ann Arbor near the Huron River. Dinner time found the family of five gathered around the table, even when it meant that Robert had to return to work many evenings and on Saturday morning. For one month every summer, Robert took time away from work, often spending the first part of this time completing home maintenance projects around the house. He was handy and creative and enjoyed the challenges that home ownership in the country entailed. Robert would often enlist the help of his children with his projects, not only to pass along his knowledge but also because it was a productive way of spending time with them. Many years, the family spent the second half of Robert’s time off at a cottage on the eastern shore of Lake Superior, in Canada. After Mark and Claudia left for college, Robert, Priscilla and Tim moved to Bostwick Lake near Rockford to be closer to Priscilla’s parents who were aging and required additional care. This move also afforded Robert the opportunity to be closer to the congregation that would help him grow in his faith. He became involved in what is now the Heritage Reformed Congregation and it became a vital part of his life. He served as an elder, taught Sunday School and was involved in many other aspects of the church. Early in their marriage, Robert and Priscilla traveled in the southwest U.S. where they explored Native American culture and sites, and often purchased the work of Native artists and artisans. After moving to the Grand Rapids area, they took day trips to Lake Michigan, delighting with all the beautiful shoreline had to offer. While at home, they enjoyed walks around Bostwick Lake and entertaining their grandchildren. Life on the lake afforded them many fun activities, from sailing in the summer to ice skating in the winter. Robert and Priscilla moved to the Raybrook Community in the early 2000’s. Robert was devoted to Priscilla and he lovingly cared for her in independent living until two years ago, when she required additional care. In April of this year, it became increasing evident that Robert required increasing care as well. Sadly, Robert passed away on Wednesday, September 12. Anyone who knew Robert Johnson would agree that he was compassionate, generous and devoted to his church and family. He made a significant impact on so many lives. He will be greatly missed by all who were blessed to know him.